When you think of a Soldier taking on Tinkerbell, you would imagine a very one-sided affair that could only go one way, but at EFC Africa 28, that hypothesis will be put to the test as Gareth “The SoldierBoy” McLellan and JP “Tinkerbell” Kruger face off in the middleweight bout in probably the most highly anticipated fight in recent history. Of course there is also the added incentive on this night of all fights being dedicated to the late Boota Guylain, in what will surely be an emotional evening. Many will not remember that Garreth and JP actually have fought one another before in their amateur days. Garreth emerged victorious in that bout, but it must be remembered that in those days it was Garreth vs. JP. Tonight will be Soldierboy vs. Tinkerbell in what will be a war of attrition, focus and explosive power. Soldierboy is undoubtedly the poster boy of EFC Africa but he will meet the jovial JP, who has a large fan base himself, in a fight that will decide the Middleweight title. Garreth has an impressive record in EFC with 10 wins and 2 defeats. 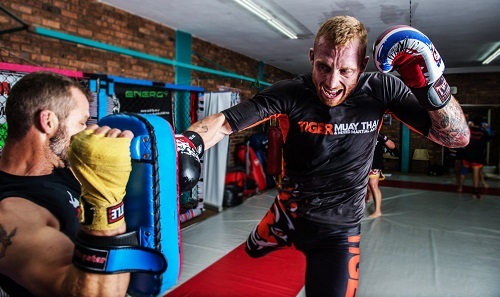 He is the first, and currently only, EFC fighter to hold a title for the second time. He regained the title with an incredible victory against Jeremy Smith at EFC 24 in a fight that he was largely the underdog. But the underdog in this fight will be Tinkerbell who has launched himself to the top of the Middleweight contenders with 5 victories from his five outings including impressive wins against Hawkey and Maphutha. The time for waiting is over, its game time! Of course no EFC night would be complete without an impressive fight card, which you can see below. My pick to watch will be the rematch between Mbuyi and Groenewald after the disappointing finish to their fight in EFC 27 and of course the Light Heavyweight bout between Du Pont and Wessels with the winner confirmed for a title fight at EFC 30. EFC AFRICA 28, presented by BetXchange.com , takes place on Thursday 27 March 2014 at the Coca-Cola Dome, Johannesburg. Tickets on sale now at www.computicket.com. Book your cinema ticket to all 13 fights live and in stunning HD at www.sterkinekor.com – available in Cape Town, Johannesburg and Durban. 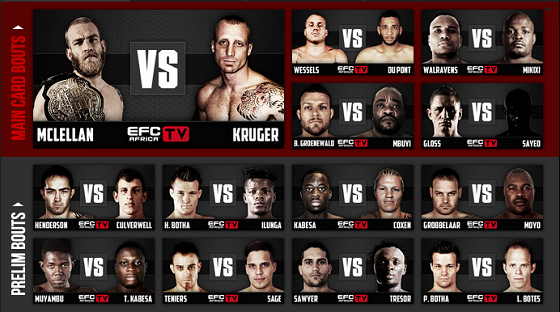 Watch the entire EFC AFRICA event live, from anywhere on the globe, via our online streaming platform at efcafrica.tv.